A feature of the Timestone Internet Ordering System (IOS) is the concept of "Live Rendering", meaning the customer sees their images inside the products ordered. The default behaviour for Live Rendering is to display the images inside the product's template. In IOS the products then appear as they would in the NeoPackProfessional print queue. While this works well for simple, single products such as an 8"x10" portrait, it is less desirable for products such as package prints, double sided trader cards, water bottles or any of dozens of other examples where the printing version of the template is not necessarily the most visually pleasing way to demonstrate the product online. To overcome this issue, Version 4.2 of NeoPackProfessional introduced the ability to create Customer Versions of templates. Any NeoPackProfessional pack layout could now also have a version that would be used exclusively when viewing products in IOS. Customer versions of templates go a long way toward making packages more visually pleasing online. They are particularly useful when a package contains only a single product, however they still present challenges. With the release of Version 4.6 of NeoPackProfessional it has become possible to create Package Templates. Unlike Customer Versions of templates which are tied to a particular product, Package Preview Templates are an independent stand-alone template that are used to depict an entire package regardless of how many products are in the package. 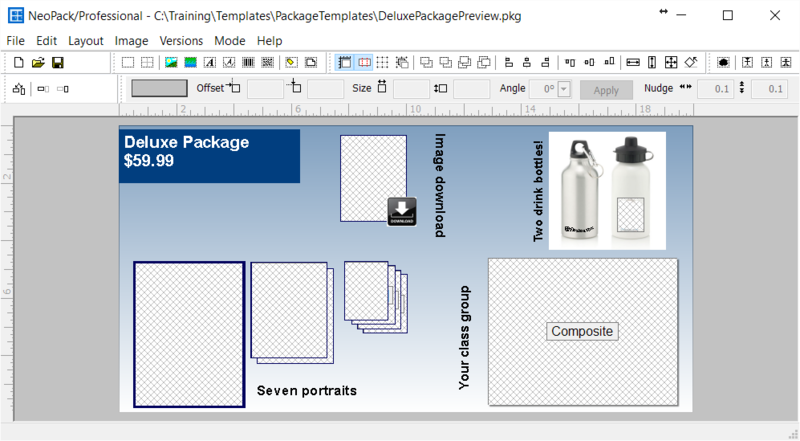 Furthermore, since Version 4.6 of NeoPackProfessional supports composite and group pages, the Package Template can be designed to demonstrate the whole package regardless of its product types. Package PreviewTemplates are created in the template designer of NeoPackProfessional version 4.6 or later. Starting a new template presents the user with the familiar 'New Template Design' window with the Package Template at the bottom of the list of template types. 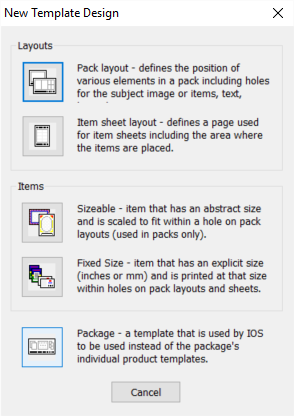 Unlike a printing template, package templates are an 'Abstract' size. Ideally they should be designed in the same aspect ratio as the package preview sizes as set in the site's settings.ini file. Package Templates are set for each package in the same manner as assigning a static preview graphic. 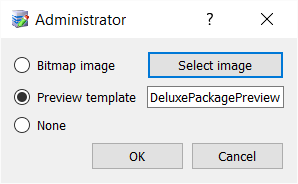 The screen grab below shows a Package Template "Deluxe Package Preview" being set for the package. 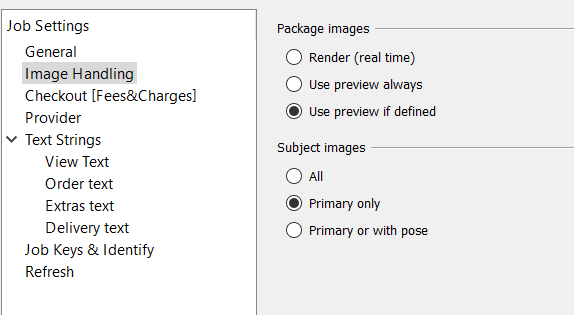 As with static preview graphics, in order to use the Package Preview Template online the job is uploaded with either the "Use preview always" or "Use preview if defined" option in the Image Handling section of tsIOS. The third package uses a static preview graphic to depict the entire graphic. Live rendering is lost.